Hello, Just found your website via the Northern Echo. I remember a group that does not appear on your list. They started off as "The Borderers" then changed the name to" The Misfits". They played mainly in the Peterlee/ Hartlepool area in the early 1960s. The vocalist /rythm guitar was Dave Inchliffe and the group included Frank Turnbull and his brother. This pic was taken in Peterlee Community Centre in the early Sixties. Loads of extra info and pics kindly supplied by Frank Turnbull who was a founding member of the MISFITS group and remained with the group as lead guitarist throughout the whole of their existance. 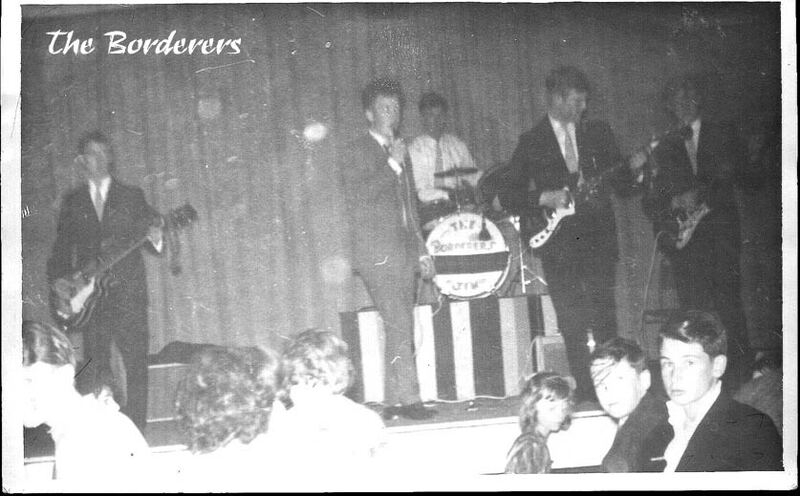 The group originated in 1958 with Frank Turnbull and David Inchliffe who together formed a duo called the Wanderers. Frank and David encouraged their friends Barry Evans and Norman Harrison to join them, playing washboard and string bass respectively. This formation allowed them to play all of the skiffle tunes of the time. Not content with the skiffle scene and limited sounds of acoustic instrumentation and home made bass and percussion, Frank and David ventured into the electric guitar world. Firstly by way of adding pickups to their flat back acoustics and amplifying the sound through tape recorders and pu line in facilities on the devices. This limited sound expansion provided the impetus for them both to buy fully electric guitars. Frank’s guitar was a Rosettii Airstream 3 and David’s was a two pickup Broadway solid body. Amplification was provided by way of Watkins Westminster and a Madrigal amplifier. Around this time both Barry Evans and Norman Harrison departed the scene to concentrate on other things. The period was now 1960/61 and the rock music of the time featured more and more groups with a four man line up of rhythm, lead, bass and drums. Frank recruited his cousin Jim Turnbull to play drums and another friend Bill Cockfield to play Bass. Neither of these new members had any previous musical experience of group playing, or the instruments, yet they excelled in the uptake and very quickly became proficient. Jim firstly bought a cheap but rather fine looking red sparkle drum outfit whilst Bill utilised David’s flat top acoustic, de-tuned for bass and later changed for a new Egmond semi acoustic electric bass. At this time the four members decided to change the name of the group to the Borderers in recognition of the family clan connections of the respective group members. Initially the Borderers largely played Instrumentals with Vocals forming a lesser part of their repertoire. But as they undertook public performances they were conscious of the need to increase their vocal strength and recruited Barry Harbottle as lead vocalist. their first paid public appearance at Burtree Caravans’, Darlington, Summer barbeque in 1961. This was followed by an appearance at the Miss Crimdon Dene competition as supporting act to the renowned professional group called the Peddlers. From hereon the group grew in both experience and popularity. Frank Turnbull (lead guitar) Sunburst Fender Stratocaster, Vox AC30 (with top boost) and Echolette S echo. David Inchliffe (Rhythm guitar) Cherry red Guild Starfire III, and Vox AC30. Bill Cockfield (Bass guitar) Sunburst Fender Precision, and Vox AC30 bass amp. James Turnbull (Drums) Premier Black pearl outfit with Turkish hand spun cymbals. Vox pa and sure microphones (both ribbon and moving coil) rounded up the vocal equipment. The group played at venues throughout the whole of the Northeast, Teesside and Yorkshire. Their popularity resulted in them entering and winning all the heats of the Northeast Beat Group competition, sponsored by the Northern Echo and Tyne Tees Television, finally playing at the Majestic Ballroom in Newcastle in the finals and being placed joint second with the Berries. The points separating the first three were so close that the top three groups (Renegades(later called the Gonks), Misfits, Berries) were all awarded a recording contract and asked to turn professional by agents running the competition. There were ten groups in all at the finals (representing the cream of the north) and the Majestic was heaving with supporters and others simply out for a great night. The atmosphere was tremendous and all of the performances were brilliant, this was the first of the rock group competitions in the Northeast. I recall one of the groups had their performance interrupted by a power failure which a lot of the performers thought was sabotage. I can’t remember the name of the group but remember I was thankful it wasn’t the Misfits that it happened to. 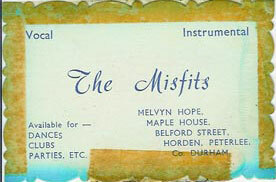 The competition was in the summer of 1963 or 64 and The Misfits went to Pye studios in London to record their record. Unfortunately the van broke down on the way and by the time we arrived at the studios we were out of time and the Kinks were in recording their first LP. We were sent to another smaller studio for a demo recording instead. The promised bookings and openings from the management agency did not materialise and as a consequence the group broke up late in 1964. Individual members did various things thereafter. Some even joined other groups/bands briefly. In 1966 I resumed my interest in groups and joined with several other musicians to form another group which for a while was called Five Like Us. The members kept changing and quality of sound was forever being affected by these changes. It was late 1966, when the member line up finally comprised Frank Turnbull (lead) Alan Bower (Rhythm and lead vocal) Bill Cockfield (bass) Jim Turnbull (drums), that we considered able to resurrect the name of the Misfits once more. During 1967 the group quite often practised in the Queens Head in Easington Village. It was during one of these sessions that we were approached by a person who was looking to place an English group in a Swiss Restaurant/night club (The Chlosterli) in the millionaire ski resort of Gstaad. After initial contact we were asked to send a recording of the group for the owners’ consideration. This was done through studios situated at Newcastle and an initial contract was awarded for the’ 67 winter season. In order to undertake the contract it was necessary for each member to return to being professional and this meant a change of drummer. John Smith joined the group as a replacement for Jim Turnbull and played the’ 67 winter Swiss scene. The group were a great success and went on to do a further two tours. The remaining tours involved a further change in the drummer to Jim Robinson. In the period 1967 to 1969 the group enjoyed its greatest success with performances to Dutch, Danish and Belgian Royalty including Princess Soraya of Iran. Performances for HH Aly Khan and the Greek shipping magnate family of Goulandris as well as performances before movie stars and other jet set millionaires. Frank Turnbull (lead guitar and supporting vocals), Alan Bower (rhythm guitar and lead vocals), Bill Cockfield (bass guitar and vocals), Jim Robinson (Drums and supporting vocals). Frank and Jim Turnbull, Barry Evans and Norman Harrison lived in Peterlee. Bill Cockfield, Melvyn Hope and John Smith lived in Horden. Barry Harbottle lived in Easington Colliery. Alan Bower lived in Easington Village and Jim Robinson lived in Bishop Auckland.